Brian Williams joined the team for the metalworking aspects of the 1002 restoration. After chipping off the rusted plates (the ones we needed to replace) at both ends, he continued to knock out the remaining rusty bolts used to secure the body to the solebar. The last bolt was removed in November 2017. 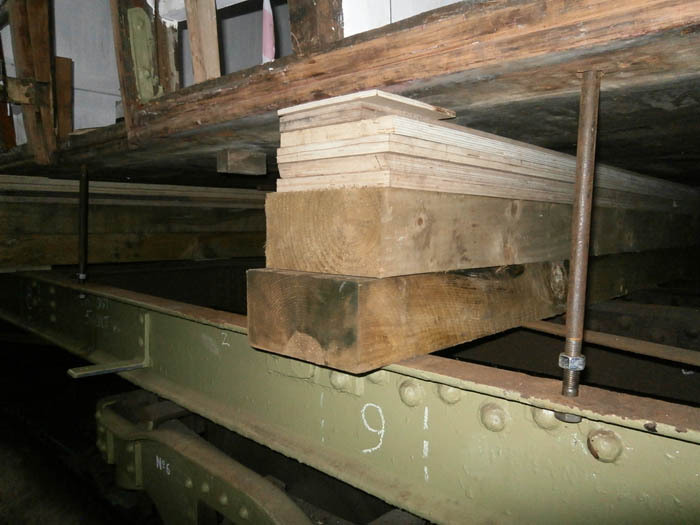 A crowbar was used to raise each of the 22 lifting points so that 9mm packers could be inserted. This was repeated until sufficient height was obtained so that a bottle jack each side could be used as the lifter (much faster). 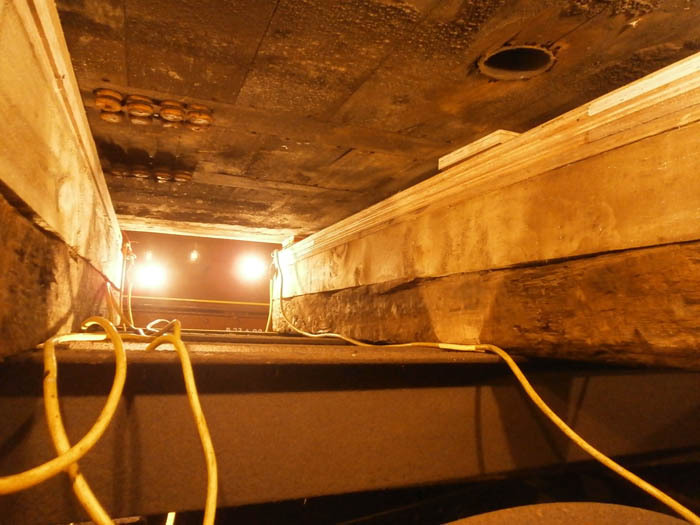 The photo above shows the lift in progress - the gap between body and solebar here is about 12". Brian can be seen using a 3-ton capacity bottle jack to ease the body up. As soon as a large enough gap was gained, another packer was put in place. The lifting took place on both sides of the body simultaneously, working from one end of the carriage to the other. In this manner, the body was lifted about 6" in one day during February by Brian and his son Ben. This photo shows the body lift completed - the gap between body and chassis is about 16 inches - easily enough to work on the chassis. 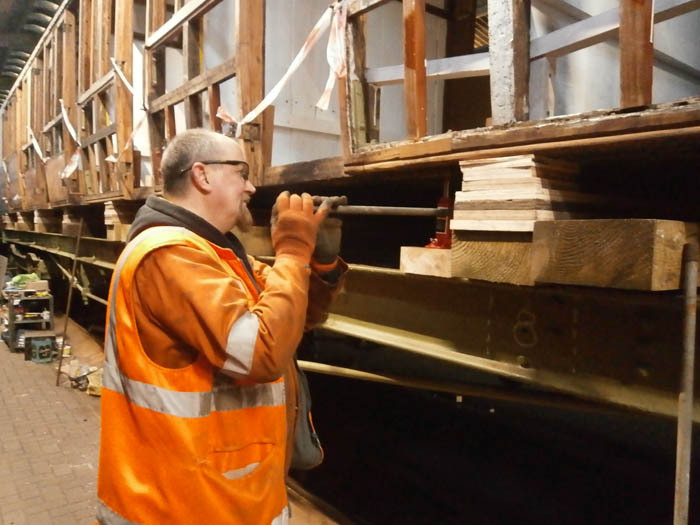 The threaded vertical rods serve a dual purpose - firstly to keep the body and chassis aligned for when it comes time to lower the body back on to the chassis and second to allow the body to be clamped to the chassis so that lateral movement is not possible when the vehicle is moved to facilitate grinding and welding which is not permitted in the RCB due to the fire risk. To make the job of de-scaling the chassis easier, a string of 110V lamps was rigged between the body and the chassis. De-scaling of the chassis was done using needle guns - a very long, noisy, sweaty and arduous job. Some components would have to be removed to allow access to some of the more enclosed parts of the chassis. One of these was the buffers and the associated springs. 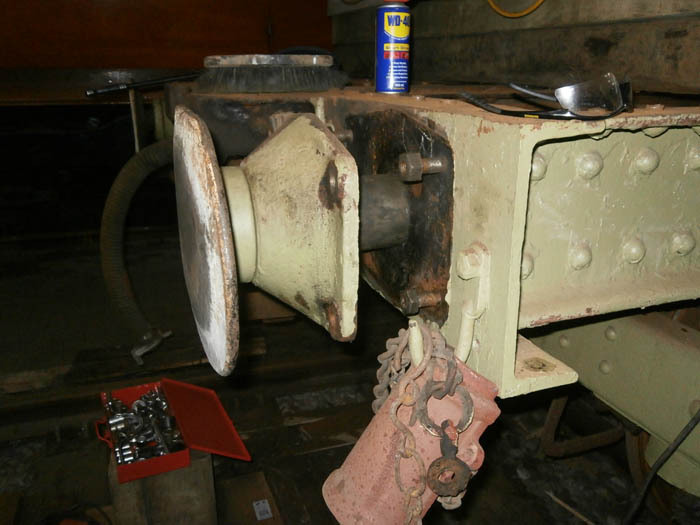 This photo shows the north-east buffer casting loosened prior to removal of the assembly. See "Help Wanted" above and to the right!